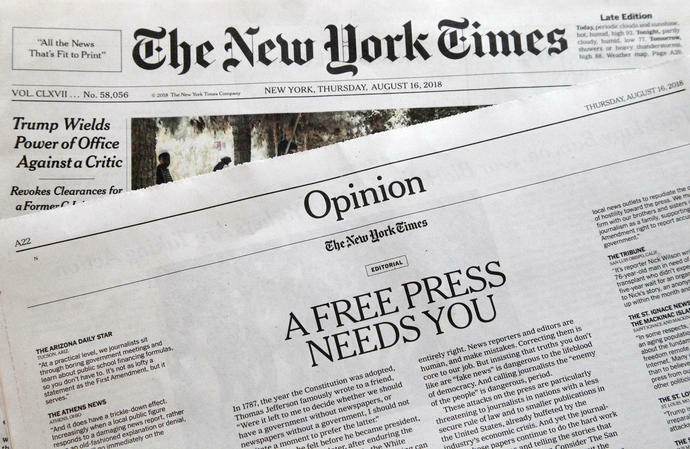 NEW YORK (AP) -- Newspapers from Maine to Hawaii pushed back against President Donald Trump's attacks on "fake news" Thursday with a coordinated series of editorials speaking up for a free and vigorous press - and, not surprisingly, Trump didn't take it silently. "The true enemies of the people - and democracy - are those who try to suffocate truth by vilifying and demonizing the messenger," wrote the Des Moines Register in Iowa. "Rather, we hope all the president's supporters will recognize what he's doing - manipulating reality to get what he wants," the North Carolina newspaper said.